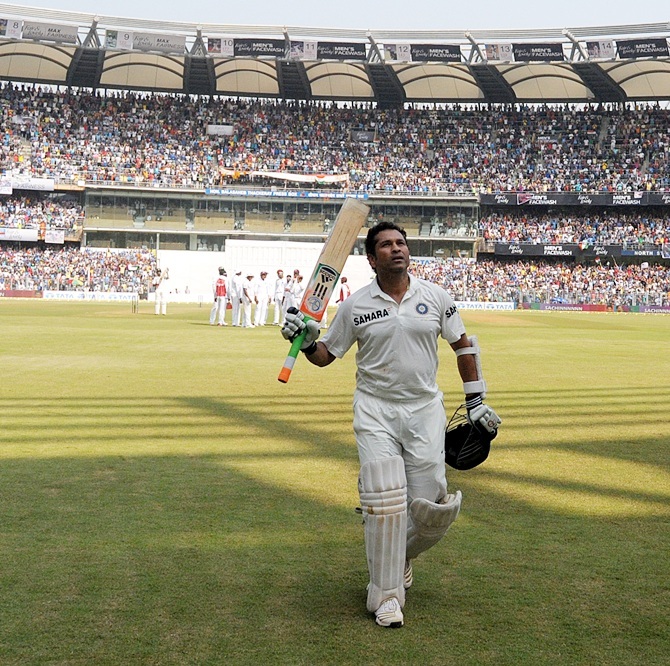 A deafening roar greeted Sachin Tendulkar as he walked out to a guard of honour in his farewell Test at the Wankhede, Mumbai. The fans came in huge numbers on Day 2 and the Master Blaster did not disappoint them. He played his trademark straight drive, which went crashing past Tino Best for a boundary to raise his half-century in grand style. The master batsman took 91 deliveries to complete his half-century, having hit nine fours in total. But it was Narsingh Deonarine who bagged the big wicket of Tendulkar in his final Test and it could turn out to be his final innings in cricket unless West Indies can script a magical turnaround. Tendulkar played a wonderful knock of 74 from 118 balls, hitting 12 boundaries in total. Tendulkar tried to cut Deonarine fine but the master batsman had to walk back. The stadium went deathly silent as West Indies captain Darren Sammy pouched a sharp catch to cut short Tendulkar's first innings knock, which could be the final display of his 24-year glittering career. "Thank you for 24 years of Sach entertainment" the giant screen board inside the stadium read as Tendulkar walked back. Will Tendulkar score a hundred? His fans want one! Tendulkar 200... and 25 years in international cricket! I saw 'God' bat today; He is so 'real', so 'ordinary'!